This typical fruit from Middle East presents its advantages. It is sweet, unique and tasty. 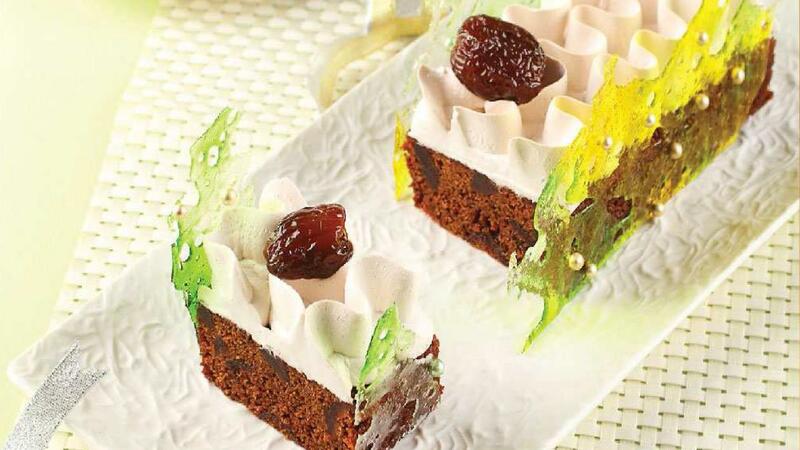 Cake with dates and caramel will be unforgettable in the middle of other dishes for your exclusive guests. Add dates, water, and baking soda. Cook them until the dates are smooth and broken and the water is getting lower and dried. Then, turn off the fire and set it aside. Whisk margarine and sugar. Next, add the eggs gradually. Scrape the side and lower side of mixing bowl from time to time. Sieve the flour and baking powder and add it to the whisked ingredients. Mix them well. Add the broken dates into the whisked ingredients and mix them well. Put all whisked ingredients into a 10x30x5 cm pan about 350 g in weight (3 cm in height). Add the dates that have been chopped into small size on the top (optional). Bake it in 160°C for 25-30 minutes. After that, put it into a chiller. Garnish it with caramel butter cream or caramel shiny glaze (as your wish). Heat caster sugar in a pan until the sugar turn into caramel. Add glucose and non dairy cream. Add them carefully into the caramel and keep whisking them with a wire whisk. Turn off the fire and take it. Then, add margarine and let it melt. After that, mix white shortening and icing sugar (if you want to be sweeter) and whisk them well until they expand. Add the caramel into the butter cream and whisk them until they are stiff. Heat a pan and add the sugar gradually to make dry caramel. Add the fresh cream into the caramel gradually with keep stirring to clean the bubbles. Next, add sugar and maizena. Mix them well and add them into the caramel. Mix them well until they are viscous. Soak the gelatin into cold water and add it into the caramel glaze. Mix them well and sieve. Put it in a room temperature about 25°C.